The following is a guest post from Kelley. Thanks again for sharing your story Kelley! We’ve been building a 192 sq ft cabin with a sleeping loft and front and back porch right on our lake shore. Our cabin sits on the shore line of a small lake in the woods just west outside if Columbus, Ohio. The building is 16’x12′ with 16′ ceilings, a 4′ front porch and 8′ back porch that overlooks the lake. The sleeping loft is 12’x8′ and has 2 full sized beds. The downstairs is complete with an open great room, kitchen with bar, and bathroom with a sink, standup shower, and composting toilet. I am building this cabin myself with help from friends and we are slowly but surely making progress! Our cabin is off grid and powered by a gas generator and will have a water pump and filtration system with water being pulled from the lake. We also have a woodburning stove and are building a stone hearth, of course complete with a small flatscreen TV that hangs above the stove. All of our windows and a lot of our building supplies have come from the Habitat for Humanity ReStore, as well as Craigslist! I am a single mom of 3 young children and we are building this together as a family while I am teaching my children what it means to work for something and then be able to enjoy your hard work when it’s completed. This project is a labor of love and serves as a getaway from busy city life and a place where we can just focus on being a family and enjoy what life is all about; complete with fishing off of our back porch! We will utilize this cabin as a weekend getaway, which in turn has already made us appreciate our small home in Columbus, a home we were feeling was too small, but is greatly larger than our 192 sq ft cabin! Our 1,100 sq ft Columbus home is definitely more than enough and I even go as far as to say I think our 192 sq ft cabin feels even larger! We are a “go-get-her” kinda family. Working hard together and inviting neighbors over along the way and throughout the process. Building small houses becomes a community event and that’s my favorite part about it! I started this project when I became a single mom of 3; to give my 3 children and I an opportunity to begin starting over and moving forward. Throughout this process, we have more than moved forward, we have grown closer as a now family of 4 and have empowered ourselves by learning how to do things we never thought we could ever do, such as my 6 year old can help frame walls, my 3 year old can help paint, and my 2 year old loves to help clean. Me, well I’m learning being a single parent doesn’t limit me and my abilities AND I can build a cabin! I am creating a very special space for my family and I, a space we built together, created so many memories together, and will have around to enjoy as a family for years to come. This entry was posted in Guest Post and tagged cabin, Columbus, Habitat for Humanity, Lakeside, off-grid, Ohio, ReStore. Inspiring story! AND nice little cabin–virtual high five for all that you’re doing and hope you find more of the rewards of such efforts. I’m sure your kids will take away great memories and values from this. Great that you made them a part of the project. I hope others will follow your example. Yay you. What a wonderful way to give your kids perspective and an opportunity to get away. Amazing!!! I’m close to Bellefontaine, OH so nice to see something like this so close to home 🙂 Love that it’s off-grid too. What a lot of great memories you and your kids are going to have in that cabin!!! You really need to install some collar ties on your rafters or your roof may start to settle and splay your walls outwards… Collar ties should be 2 thirds down from ridge. This may cause some headroom problems but other folks should be aware this is a very important part of a building. Collar ties could be installed but the pitch of the roof will keep most of the snow from accumulating and the loft over half the cabin should keep the roof from bowing out. I am a little concered about the short-wide window on the side. There is a double 2×4 directly under the loft and over the center of the window. I would be tempted to install a 2×6 header spanning the window to take the load off the window. Awesome job! Love how the kids want to be involved, and the memories your all are making! Hope you share pics when completed! It would be important to know how the loft floor frame was tied into the sidewall. She could add collar ties just to the area not above the loft if the loft frame functions as a tension member between the side walls. I wonder if a building inspector has been by. WOW! You are not only beautiful but a wonderful creative and strong woman! I am so inspired by you. I bought a small cabin in the woods seven years ago. No water but just what I could afford. I didnt want big or fancy, just something that I would love for years and years to come and morgage FREE! I wish you all the best and a wonderful future for you and your beautiful family in this house!!!! We women can do ANYTHING if we just put our minds to it! I stumbled upon this article, and I love what you’ve done! My husband are have been researching tiny houses and living off the grid. We plan to retire in 5-8 years. We are also looking into small (less than 500 sq ft) earth-sheltered or straw bale homes in which we could live debt-free without many bills. We currently live in Delaware County, OH. The building codes in this county are outrageous and cannot see building our tiny house here. If you don’t mind, would you share approximately whereabouts your cabin is located? We would like to find a small lake to live near. Thanks! I am also a single mom and have had the same vision for years! It’s only been recently with the emergence of the tiny house movement that I’ve been able to see how to practically address the needs of single moms without having to be “supported” financially by a government program/non-profit/church. I’d love to connect with anyone else who would be interested in really moving forward with this sort of idea of a tiny house community with supporting business. Where have you ladies been all my life! When you guys start drawing up plans please let me know. I’m itching to work some soil. Did I mention that I am a city gal! I’m a retired 61 yr old lady. I’d like to be around people and do something to help me make friends, get involved and help others. I have no family as my only child just passed away in December of 2015. Please send me more information about your project and what if anything I could be a part of in the creation. You can email me at : Below information. I live in Johnstown, and work in Hilliard. My concern has been state and local laws preventing living in such a small house. Great cabin, good job. I wish this family the best! Love your cabin!! I also live in Columbus Ohio and I’m trying to find a place to build a tiny home. Any suggestions? Right now I’m in the research phase. Buckeye Lake has small inexpensive lots to build on; however the minimum square foot requirements are 850. Not exactly tiny but getting closer than many communities. Great House love the way fix the window over the bed….I love this one all so. Wow, this is great !! Bravo to you for taking on such a ‘BIG’ project with little kids. Also, thanks for shopping at the ReStore. It is a great resource for those who need a little extra help, and all the proceeds benefit Habitat and their mission of ending poverty housing. May God bless this project, and your family !! Congrats! It’s looking good! I’m a single dad of two. I’m in the Columbus area, getting ready to do the same. finishing up the design. Teach Renewable Energy and sustainable building as well. Glad to see some more people doing this. I LOVE this! I just found your blog on line. I was googling tiny houses in Delaware county Ohio because this is what I want to do. Would love to pick your brain some time. I will be going back through your posts. You are really inspiring! THANKS! Cuddo’s! I admire your strength and vision — your gift to your family will be remembered forever and valuable life lessons! First off.. you’re awesome and I absolutely admire your determination and positivity! Im a single father just starting on my own tiny house. It took alot of back and forth on deciding whether it was righr to have my 7 year old daughter grow up in. She’s extatic about it, loves to help with the building and it’s given us a way to really bond. I wish there were a website or network for single parents to throw ideas and concerns back and forth. A like minded network of people would be invaluable. Awesome work with the house! It looks amazing! What I was searching for that led me here was, will Ohio allow people to live in a tiny home like this? I’m considering moving to NE Ohio but if I do I want to be able to live this kind of lifestyle there. Awesome your thinking of taking the plunge to build a small cabin. Your question about how to find land is probably the question I get asked most so I am going to write a blog post about this later today. Go to http://www.cabinchick.com and click on Blog. The post about this isn’t up there yet but you can still take a look around the other parts of the site if you’d like. Also Laura Ling with Seeker Network is coming out next Wed so you can keep posted on all of that on the site too. Keep in touch and all the best to you and your build! Wow! What an inspiring post this is! Your awesome. I also live in Columbus Ohio and I’m trying to find a place to build a tiny home. I have been researhching for over a month. Any suggestions? Awesome job it looks like a cute house to live in. I would love to see your tiny house I live in Athens county home of Ohio University and would like to build a tiny house to live in full time. Single mom now and empty nester that has a house that is to big for me. Hi Jane! Thanks for saying hi! To see more about what I’m doing and how to add this into your life, too come visit me at http://www.cabinchick.com. I’m starting to document my journey more as well as have some resources to help. All the best to you! Way to go Kelley!!! My issue is locating property, that does not cost a kings ransom! I have complete interest in this, but my ideal would be a permanent dwelling. Me and my pups, can live in a much smaller space. We are currently living in a 1040 sq.ft. raised brick ranch home and I find this space to be far to large. About two years ago, I found myself jobless and not ever wanting to go back to the corporate lifestyle, again. I treat this as a ‘crossroads’ of my life. I helped both of my parents, through their eventual end days and now I find myself free to go anywhere, but I am hopelessly rooted to remain near my remaining family. If I could locate a lil slice of heaven, my hands would be untied and I could begin the process of building, along with purchasing your ‘very affordable’ building plans. Although, I will require slightly more than off grid, as I have a hobby wood shop that would require electric. But that would not be a problem, because I already have 20kw propane fired, instant on, Eaton whole house generator, to my name. So, once again… where can I find property, that won’t break the bank… any ideas? Please advise! And thanks for your inspriation! I just read your article!!!! What an awesome house!!!!!! You are an incredible and awesome lady!!!!!! I am so impressed by what you and your small children did!!!!! You pulled yourself out of a bad situation, and just look at what you accomplished!!!!! You should be very, very proud of yourself!!!!! Congratulations once again!!!!! Keep moving forward!!!!! You’ve only just begun!!!!!! I just read your article…..you are so bless mother!!!! I need help! I will plan to buy tiny house with wheels but where I can my tiny house parking? I work at Tuttle Crossing, Ohio and my husband work at Westerville, Ohio but we live with pastor’s house in Marysville, Ohio with ONE car! My husband just applied a job at Costco store in Plain City, Ohio…..I need find land or parking for my tiny house with wheels. Help Help Help me, please!!!! Thanks Kelly. Your kids have the best mom ever! I forgot to subscribe your website. Thanks for remind that I’m looking forward to see your complete cabin, Kelly. Thanks Edward! 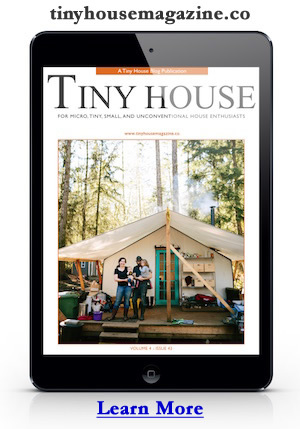 What’s your interest in tiny houses? Are you building one yourself? I love to see people design their own living space, especially tiny houses cause it’s so creative and inspiring. I’m living in a small house with my family and maybe I’ll start build my own tiny house in the future.